2% of the UK population have a diagnosed allergy and many of those will be carrying an adrenalin auto-injector. We trust them, we know these little devices save lives and they give us some security that we have instant access to the drugs that will hopefully reverse an anaphylactic reaction and give time for emergency services to arrive. But how many of the adrenaline carrying public have the same depth of skin, fat and muscle in their thigh? Directions of where to inject can vary but you can watch video’s on the websites of the auto-injector you use. It’s usually suggested to inject the outer thigh about a third of the way down from your hip to knee. Does it matter where in the thigh adrenaline is administered? Knowing that human beings all come in very different shapes and sizes, especially women, suggests that possibly this might vary considerably from person to person. Does it matter which adrenalin auto-injector I have and where to inject? The needle length for both EpiPen and Jext is approximately 15mm. For the Emmerade the needle length is quite a bit longer at 25mm. How significant could this length be? and is 25mm even enough in some cases? Take the image above of my skinny thighs being ultrasounded. I wanted to check that my adrenaline auto-injector would work as I’ve use one on a number of occasions and never actually felt like anything was happening. Having spoken to other people and heard how they felt, you should experience a massive rush of adrenaline, literally. You might feel dizzy, light headed, get a head ache, but you should most definitely feel like something is happening. I have always felt nothing at all, and as if the reaction was just carrying on. Not encouraging at all. Mine are fairly lean size 10 thighs and I do try to keep fairly fit, walking, cycling and yoga. So would my fat to muscle ratio put my mind at rest? You can see above that the depth scanned showed that it would just about be suitable for either EpiPen, Jext or Emerade but the distance on my legs was borderline with only a few mil to spare. However at the top of the thigh where some instructions and videos suggest injecting, there is only JUST about enough depth for the adrenalin to penetrate through the muscle. If the layer of fat to muscle is too thick this may mean adrenaline will not get into the body fast enough and whilst some may get into your system, you may not get the full dose. Adrenaline needs to be injected straight into muscle to work effectively. I now have an Emerade auto-injector as I felt that the ultrasound was a little worrying. My weight can vary from month to month, this ultrasound was done when I was fairly skinny and when I previously used the adrenaline I know I was heavier by about a dress size. Could this have been enough to mean the adrenaline didn’t get into my muscle properly? If you are injecting through clothing, as is normal with the guidelines for using auto-injectors you would need to add a millimetre or so to that depth. If you were wearing thick denim jeans perhaps even more. “The European Medicines Agency (EMA) are currently reviewing the adrenaline auto-injectors approved in the UK. Adrenaline auto-injectors need to deliver adrenaline into the muscle, the UK review concluded that there is no robust evidence that this is the case for all patients. Depending on individual factors such as skin-to-muscle depth, adrenaline may instead be injected under the skin (but not into a muscle), which may result in a different absorption profile (uptake of the medicine by the body). The European Medicines Agency will now review the available data on the delivery of adrenaline from auto-injectors and on whether the product information contains clear and detailed instructions for appropriate use, and issue an opinion on the marketing authorisations of these medicines across the European Union (EU). 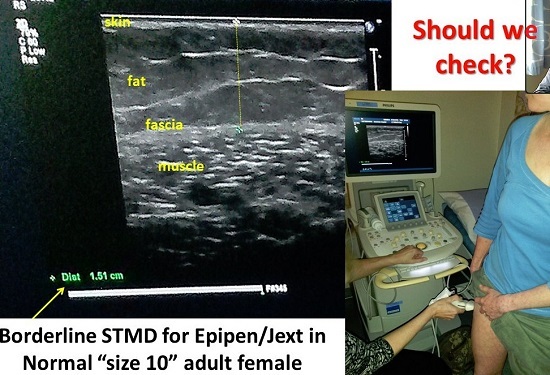 Michelle Berridale-Johnson of Foods Matter debates this very subject, suggesting that since these injectors were designed for the lean thigh muscles of fit army personnel they may very well not be quite fit for purpose for the varying sizes of the general population. You can read more in ‘The needle debate in anaphylaxis treatment’. You can read the statement on The EMA website here. The Anaphylaxis Campaign website has some information about this review available too and if you are at all in doubt please call their helpline on 0333 255 9912 or speak to your doctor. What is important is that you don’t panic, and please continue to carry your adrenaline with you at all times. My advice, if you are worried would be to take the details of the review to your doctor and ask for an ultrasound to find your optimal ‘spot’ or area that will be effective for your pen. They should provide this examination for free and it will only take a matter of minutes. Ultrasound equipment is available all across the country so there should be no excuse for not finding an appointment. You can also investigate getting an Emerade pen which has a longer needle. Some initial studies show that most men should be fine with any injector, but some women may not so make sure you are not one of those. A few recent deaths of young slim women who have died of anaphylaxis despite being injected correctly with more than one adrenaline auto-injector. Could it have been that their injector just couldn’t reach their muscle? Please, please don’t panic about this. The review is great news because none of us want to feel we are just carrying around a placebo. Adrenaline can save lives but only if is injected into muscle correctly. If it has no chance of ever reaching your muscle it’s useless! What my ultrasound showed above is that you can’t tell from looking at someone what their muscle depth will be. Don’t let your doctor fob you off. My specialist gave me one look when I asked for an ultrasound to find out my muscle depth and said, “You’ve got nothing to worry about.” as he pinched my thigh to find some non existent fat… I’m not joking. I only wish I was. I got this done privately at Amersham Hospital but this review should mean none of you have to go through that. Most of all, I want all women who use an auto-injector to get checked. It takes minutes and will hopefully put your mind at rest. This review is well overdue in my opinion but it’s great news that it’s happening. I think what will happen afterwards will probably include guidelines for administering auto-injectors including a simple basic ultrasound test to determine which injector will work best. It may be that the area to inject may change or we might have a different place each! Now that would be confusing. Perhaps an ‘X’ marks the spot tattoo would help? Everyone will be different, but the closer to the knee on my thigh gave a shorter distance to the muscle so for me, this would be a safer place to inject. This will depend also on where the best muscle is on your own thigh and could vary for other people. So have you used your adrenaline? What did it feel like? Did you get a rush of adrenaline? or feel not much at all? How do you feel about this review? Getting yourself an ultrasound? An allergy and health writer and freelance copywriter, Ruth is passionate about helping those with allergies and food intolerances take control, embrace their condition, and learn to live with and love who they are. It can be very lonely finding you have allergies and discovering what helps you can be a life long journey. What works for one person won't work for another, so after trying nearly every allergy treatment under the sun and finding hours of research necessary to keep abreast of what's going on, Ruth started writing her blog, What Allergy? in April 2009. Ruth has life threatening allergies herself to all nuts, all diary, tomatoes and celery and knows first-hand what it's like to have an anaphylactic attack. Voted in the Top 5 UK allergy blogs by Cision UK in 2011, What Allergy is packed full of interesting articles, hints and tips and product reviews which are a must read for anyone with allergies, food intolerances or sensitivities, asthma and eczema. From subjects such as "What is celery allergy?" to "Surviving a holiday abroad with allergies", it's packed with useful and interesting information. You can register free for a weekly newsletter by visiting her website http://whatallergy.com/ and also keep in touch by following her on Facebook and Twitter.